Multi Boot USB for Windows XP - a program designed to write a Windows XP system image to a memory card or bootable USB flash drive. Great for reinstalling the system on devices that do not have a DVD drive. The utility allows you to create dual-boot configurations, offering the user an independent choice at the time of launch. The main functionality of the application includes the record manager of the download manager and the ability to save the information received in a text document. For ease of use, users can export and import system configuration data. 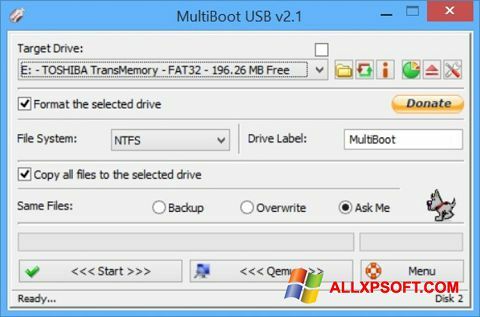 You can free download Multi Boot USB official latest version for Windows XP in English.